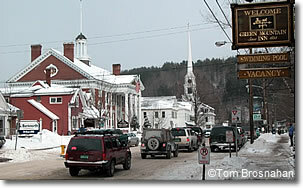 Stowe has an inn, resort, hotel, motel or B&B just for you. Stowe has lots of good skiing and lots of good summer activities, and therefore lots of good hotels, motels, inns, B&Bs and resorts. The broad range goes from spartan skier dorms to plush resorts with every luxury accoutrement and service. Few of Stowe's lodgings are in town. Most are scattered on and off the Mountain Road (VT Route 108) which wanders for 10 miles (16 km) north of the town all the way to Mount Mansfield and Smugglers' Notch. 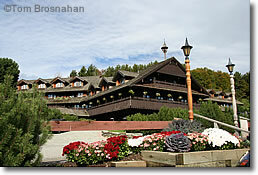 The Trapp Family Lodge in Stowe VT.